Last week, I showed off a method for processing LRO-NAC. Now I’m going to show an even more difficult process with HiRISE. Each observation of LRO-NAC was 2 CCDs and it made for a lot of click work. In the case of HiRISE, it has a whopping 10 CCDs. This will make bundle adjustment very tricky if we treated all 20 files as individual cameras. To get around this problem we’ll deploy a new feature in Jigsaw (the Observation option) and we’ll have to modify the HiEDR2Mosaic script that is released with Ames Stereo Pipeline. I recently found out that there is a nifty UofA site from Shane Byrne that details all the stereo pairs captured by HiRISE. It is available at this link. I then stalked the user ‘mcewen’ and process a stereo pair he selected. If I was a nice guy I would process stuff selected by user ‘rbeyer’, but he images boring places. Loser! Anyways, for this demo I’ll be processing ESP_013660_1475 and ESP_013950_1475. 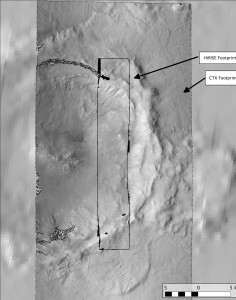 UofA says it’s a “Gullied 35 Kilometer Diameter Impact Crater in Promethei Terra”. Whatever, I just want 3D. At this point I would normally tell you to run HiEDR2Mosaic blindly. Unfortunately that won’t work because that script will attempt to project the outer CCDs into the RED5 or RED4’s frame of reference. Any projection is bad because it requires using the spacecraft’s ephemeris, which we don’t trust and we haven’t corrected yet. It also won’t work because noproj will drop some observation serial or whatnots. To fix this, we want to stop HiEDR2Mosaic right before it does noproj. Then we’ll perform our jigsaw and then afterwards we want to resume the process of HiEDR2Mosaic. Doing that required the modification that I checked into Github here. Just download the ‘py.in’ file and rename it to ‘py’. The ‘in’ suffix just means that our build system is going to burn the ASP version into the script at compile time. No magic here, it’s same process as usual for creating a control network. I just picked a special XSpacing of 200 meters and YSpacing of 3 km for Autoseed. This was to make sure that there would be control points on all 10 CCDs. I was guessing that a single HiRISE CCD had a swath of ~500 meters. I also made the MinimumThickness a very small number (something like .0000001) since the HiRISE CCDs are very thin strips. After Autoseed, you then proceed to manually clean up the control network and it will take a very long while. Then you should perform a couple of jigsaw runs to identify control points that have mistakes and correct them in qnet. However, for HiRISE all your jigsaw runs should use the option, observations=yes. This says that images with the same image serial should be treated as the same camera or observation. So CCDs 0 through 9 will be treated as a single camera. Without this flag, jigsaw will never converge. You might be asking why I didn’t use this for LRO-NAC, that camera also had multiple CCDs. That’s because in the case of LRO-NAC, the CCDs are in two separate optical housing whose position and angle changes noticeably with the thermal cycling of the spacecraft. On HiRISE, all the CCDs are on the same optical plane and they all use the same optics. It is not noticeable at all. If you use the observation option for LRO-NAC, you’ll find that it is impossible to get a sigma0 value under 2 pixels. In my last post, I tried an idea where I didn’t use any ground control points and tried to make jigsaw auto register to the default ISIS DEM, which is usually the best altimeter data available. I wanted to try that again, unfortunately HiRISE doesn’t have a big enough footprint to cover much detail in MOLA so I added 2 CTX images to the jigsaw problem. Those images were B10_013660_1473_XN_32S256W and B11_013950_1473_XN_32S256W. I made their control network separately and then used cnetmerge to add them to the HiRISE network. I then proceeded to match a bunch of the control points between the two imagers. This would have been easier if I had just processed the images from the beginning together. Another problem I noticed from the last post was that with every jigsaw run, all control points would start from the ‘apriori’ position. I was updating their radius with cnetnewradii, but their latitude and longitude kept being locked back to their original position. I wanted this to be like ICP, so I modified my script so that after every jigsaw run, ‘apriori’ latitude and longitude would be replaced by their ‘adjusted’ solution. Below is that code. Running jigsaw in this case was just running my script. Unfortunately I didn’t see the standard deviation of the radius correction reducing ever. So possibly my whole idea of a jigsaw without control points is flawed, or I need a better height source. I really want to go back and redo LRO-NAC now. After we finish our bundle adjustment, we now finish our HiEDR2Mosaic to create a single image of a HiRISE observation. This looks like the following with the modified script. Notice specifically that I’m giving the script the histitch cube files this time instead of the IMG files. I ran the stereo command like this and I used the default stereo.options file. That just means everything is in full auto and I’m only using parabola subpixel. Thus, my output DEM looks little ugly up close. Then I used the following point2dem option. Notice I’m using a custom latitude of scale so that the crater of interest will be circular in the projection. Here are the difference maps between MOLA and a non Bundle Adjusted ASP HiRISE DEM (Raw), a Bundle Adjusted DEM with no GCPs, a Bundle Adjusted DEM with no GCPs but with the addition of the CTX imagery. We can see that the bundle adjustment helps definitely; it removes a 200-meter error. Adding the CTX imagery definitely helped reduce the error against MOLA. 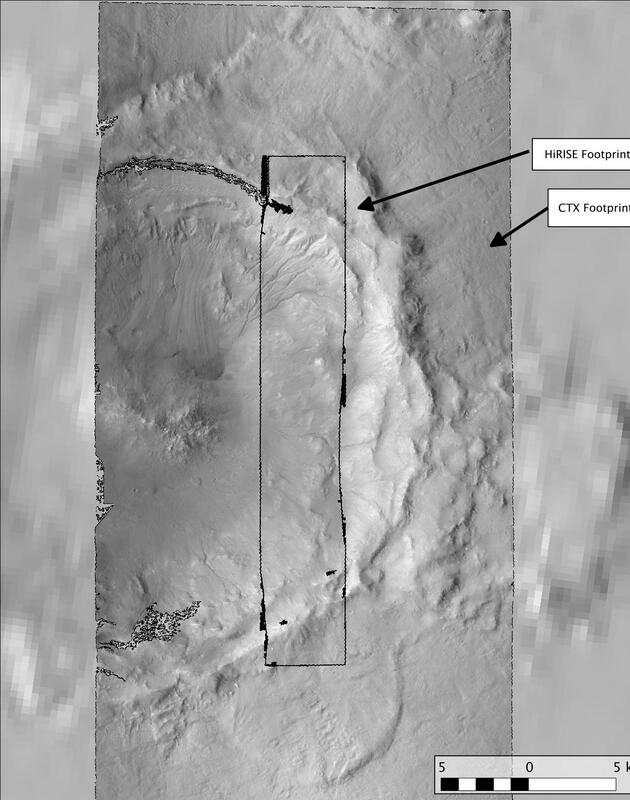 However if we look at a DEM that can be created from the additional 2 CTX images we processed, we’ll see that there are still large pockets of error around the rim of the crater. When I flip back and forth between the MOLA hillshade and the CTX hillshade, I think I can definitely see a shift where the CTX DEM is too low and slightly shrunk. So possibly my whole ‘no-gcps’ idea might be bunk. For the case of Mars, it is really easy to go get ground control points against the THEMIS mosaic or a processed HRSC observation. You’ll just want to chain THEMIS Mosaic to CTX and then to HiRISE since there is such a large resolution change. I’ll leave it as a homework assignment for someone to work out the exact commands you need to run. At least now you should understand how to bundle adjust HiRISE. This entry was posted in ISIS, Mars, Stereo Pipeline and tagged Adjustment, Alignment, Ames, ASP, BA, Bundle, Correction, DEM, Difference, DTM, Elevation, Flag, gcp, Hieder2mosaic, HiRISE, ISIS, jigsaw, Map, Model, NASA, No, Observations, Pipeline, Process, Stereo by admin. Bookmark the permalink.